Governments and businesses are two different entities that exist in society. Governments and businesses are also classified as social institutions that benefit society in general as well as its members. Both share the same features with varying differences. A government is an entity that exists to govern and represent collectively a society or a country and all its avenues. Governments strive to fulfill the needs of all of its members and to provide a sense of wholeness and a national identity to a particular country or people. The term is directly associated with power and ruling, bureaucracy, politics, and the system to govern a certain society or people. Government is also often associated with the State. On the other hand, business is more associated with trade, occupation, commerce, and transactions that involve the profit making of a particular person or industry. The term is also used in the mechanism of providing goods and services to a willing market. 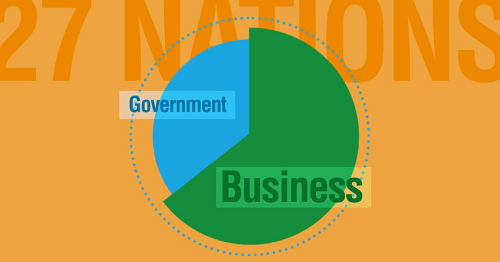 The similarities between business and government are not easily recognized at first. Both are systematic organizations. They both have appointed leaders and members. There is a faint difference since the election of a leader in the government is decided in the government’s Constitution and form, while businesses usually have the owner or entrepreneur as the leader of their organization. Businesses are created to stimulate profit for the individual or for a small group of people, while the government generates its own profits from taxes and other forms of fees accompanied by government services and transactions. Since the government also taxes businesses and owns companies, the government’s revenue can rival a multi-national business’s profit. As a system, both business and government have their own set of laws. However, the laws made by the government often have a wider jurisdiction than individual business laws. Moreover, the government creates laws for the business sector, while the sector itself cannot create laws unless they pertain to the business itself. It cannot contradict and must follow what is already imposed by the government at risk of getting shut down due to violation. 1.“Government” refers to the system and institution of governing and managing a certain society or country, while “business” is a systemic organization of providing industries, services, products, and profits to people. 2.Governments have a wider jurisdiction compared to businesses. Governments also have numerous agencies that cater to public services. The institution provides a sense of equality as well as national identity. On the other hand, businesses provide people with opportunities to earn and make money with their skills and talents. 3.All businesses are under the government’s control. The government provides the business an opportunity and legality to earn profits in return for taxes. Government laws regarding trade, operations, and transactions are implemented and incorporated in many business laws. A certain corporation or business must adhere to the existing government rules and standards aside from their own business practices and concerns. 4.A government’s head or leader is elected depending on the nature or form of government in a society, which is usually stated in the nation’s Constitution. The head of a business is traditionally the owner or entrepreneur, unless another body dismisses the owner for various reasons. 5.A business gains profits by selling goods and services and making use of a market as its intended receivers (of goods and services). On the other hand, a government also earns profits implemented taxes imposed on eligible workers, businesses, and other various entities. Governments can also earn profits by imposing a transaction fee for a particular service in the various government agencies and offices. A government can also own businesses or corporations to increase its assets. Celine. "Difference Between Government and Business." DifferenceBetween.net. February 6, 2018 < http://www.differencebetween.net/business/management-business/difference-between-government-and-business/ >. That is wrong with the government….it needs to stop most of what it does. It should only be providing infrastructure, police, fire, medical and military to keep this country safe. Not welfare and food stamps and 2000 other federal tax programs to take from people who are working and giving to other people who are not. The politicians are in the way of this country from growing up and driving businesses to go to other countries to do business more cheaply because their are to many greedy s.o.b.’s here in the USA. There are 2,790,000 federal employees out their NOT making a product only making an income which interns all the benefits and pentions which results in millions of dollars out of tax payer pockets. We need to fire 2.7 million federal employees, we just don’t need that many people of the federal tax paid pay roll. If the government needs something done they can contract it out at a REASONABLE amount of money for the specified job that is needed. Military forced their employees at $99 per bag full of laundry to be laundered. A lady to take the names of people coming into use the internet and she was paid $100,000 + yearly to write the names down on a piece of paper. This is a total waste of money. We have 1000’s of people who are homeless, fire stations and schools closing because of lack of money. Our government is a joke.